Louis Vierne (1870-1937) was a French organist and composer. Vierne was born on 8th October 1870. He was born nearly blind and showed an early aptitude for music. Like Gabriel Faur&eacute;, he was an assistant to the organist Charles-Marie Widor at Saint-Sulpice in Paris, and from 1900 was principal organist at Notre-Dame de Paris. Vierne was considered one of the greatest musical improvisers of his generation, although most of his works were never written down. Vierne was born on 8th October 1870. He was born nearly blind and showed an early aptitude for music. Like Gabriel Faur&eacute;, he was an assistant to the organist Charles-Marie Widor at Saint-Sulpice in Paris, and from 1900 was principal organist at Notre-Dame de Paris. Vierne was considered one of the greatest musical improvisers of his generation, although most of his works were never written down. He had an elegant, clean writing style that respected form above all -- even the few of his improvisations on early phonograph recordings sound as if he was playing finished compositions. His harmonic language was romantically rich, but not as sentimental or theatrical as his early mentor C&eacute;sar Franck. Of all the great fin de si?cle French organists, his music was perhaps the most idiomatic for his chosen instrument. His output for organ includes six symphonies, "Twenty-fourFantasy Pieces" (which includes his famous "Carillon of Westminster"), and "Twenty-four Pieces in Free Style". There are also several chamber works (including a sonatas for violin and cello, a piano quintet, and a string quartet), vocal and choral music, and a symphony in A minor for orchestra. 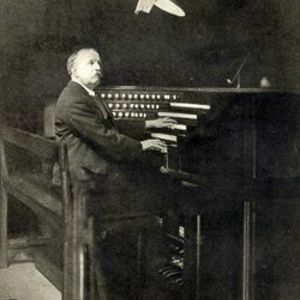 Vierne suffered a stroke while giving his 1750th organ recital at Notre-Dame de Paris on the evening of 2nd June 1937. He had completed the main concert, which members of the audience said showed him at his full powers. After the main concert, the closing section was to be two improvisations on submitted themes. He read the first theme in braille, then selected the stops he would use for the improvisation. He suddenly fell forward, his left foot coming to rest on the low "E" pedal of the organ. He had thus fulfilled his oft-stated lifelong dream: to die at the console of the great organ of Notre-Dame.